When I first came to Italy many years ago, I lived in a town on the Tyrrennian coast. The post-war town had tree-lined streets of two-story houses. The garbage collectors came on bicycles. They left plastic bags each time they came, and we filled them with our trash. On collection day, we put the bags outside and the cyclists collected the trash and carried it away in large cylindrical containers attached to the front of their bikes. An idyllic method for an idyllic setting. Things are different here. Rome is a city with narrow streets and no alleys. There’s no place to hide the trash. The dense population creates mountains of trash daily.When I first moved here, a row of dumpsters stood outside the front door of my apartment building; others lined the block a few doors down. Colors indicated what to put into each: white for paper; blue for plastic, glass, and metal; green for everything else. Trash trucks came every morning to empty the green ones, but the other two were emptied infrequently. Often, piles of bottles and bags of paper littered the pavement. And dumpster diving gypsies patrolled the neighborhoods on a regularly scheduled basis to dig through the trash, ripping open bags of garbage in their quest to find things to resell. A couple of years ago, the city began a new recycling program designed to educates citizens slowly in an attempt to change behavior, and I think it’s working. I live in one of the experimental neighborhoods, and the process has fascinated me. First, notices went up announcing that the city planned to begin collecting organic garbage to compost. The green dumpsters would be removed, and everyone would be given a container for kitchen scraps. These notices remained in place for a few months. Then employees of the city trash removal service visited every apartment in the neighborhood, handing out buckets, paper bag liners—with instructions printed on the outside. Every morning—weekends and holidays included, small trucks park throughout the neighborhood, collecting the organic trash in one container and non-recyclables in another. The trucks move every couple of hours, but they are only a short walk for the residents. For me, there’s one available in every direction I might take when I exit my home. 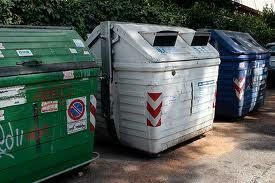 Many people chose not to participate in the program and continued to put their trash in the dumpsters as usual. Then one day, the city took the dumpsters away. On my block-long street alone, this action freed up about a dozen parking places. Dumpsters for recycling paper, plastics, etc. moved around the corner. They are emptied daily. 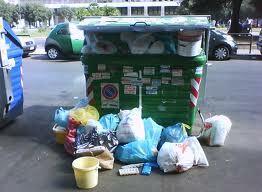 While many people still don’t recycle, more and more do participate in the program. A number of independent recycling efforts had already been initiated: medical waste containers stand outside all pharmacies; used clothing receptacles dot the city; little boxes to receive spent batteries can be found on many streets. This education program provides a complete guide of what to recycle where. 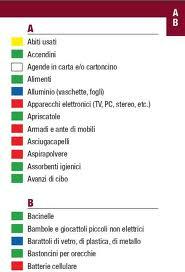 The color-coded guide provides an index of things you might want to throw away. Have some leaves and flowers from gardening? That’s brown for organic. An umbrella? Green for non-recyclable. The program hasn’t made its way across the city yet, but in my little neighborhood, things seem cleaner. That’s a good thing.